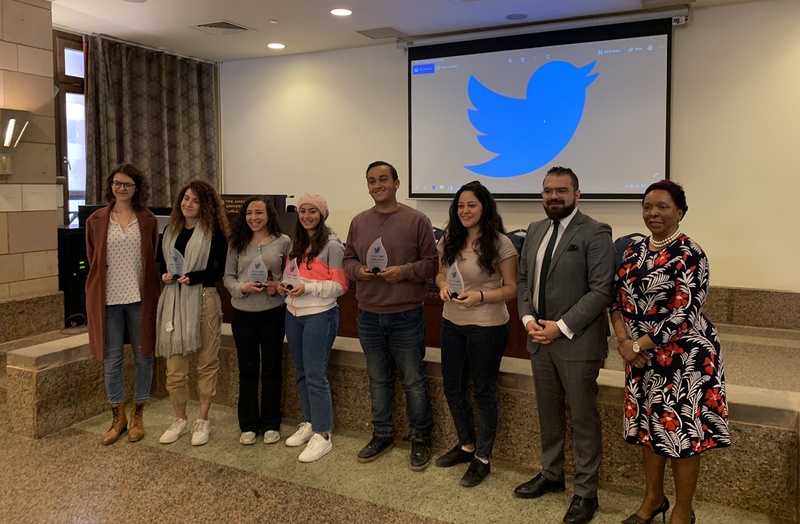 March 27, 2019, Cairo – The American University in Cairo (AUC) announced yesterday the winners of #TweetRight competition, which was coordinated by AUC’s Academy of Liberal Arts, Common Reading Experience (CRE), and Twitter. The winning team of students who created Twitter account @Justnewsauc received a Twitter MENA Innovation Award and $5,000 Twitter for Goods Ads Grant. The second prize went to team @PowerKnowledge7, who also received a Twitter MENA Innovation Award. The competition allowed teams of students to create a Twitter account and tweet with the aim of identifying misinformation/fake news (a key theme of this year's CRE text Fahrenheit 451). Tweets of the winning teams were the most creative, active, and engaging among the competing teams. Themes of Fahrenheit 451 also included knowledge and power and human Interaction in the age of digital technology. The judging panelists were George Salama ‘05, head of Twitter Public Policy, Government & Philanthropy for the Middle East and North Africa region and Stefanie Felsberger, senior researcher at AUC’s Access to Knowledge for Development Center (A2K4D). @Justnewsauc Twitter account that won first prize was created and run by freshmen students Freddy Eskaros, Carol Zaki, Joy Wanis, Farah Abdelsalam and Rola Amro. The idea behind the account was to show how fake news travels fast and raise awareness on the need to check the credibility of news sources on social media. The five students created an account that reported fake news yet in the bio they mentioned that the account is not a trusted source of news. “We found that some retweeted the news we created as jokes and some others actually believed them,” said Eskaros, “The main problem that we face on social media is that people believe anything they read even if it is a joke,” said Eskaros. He also added: “We believe the open exchange of information can have a positive impact on the world. We work on harnessing the positive power of Twitter through civic engagement and partnerships such as the one we have developed with AUC.” As part of Twitter’s global media literacy efforts, Salama explained that they have been working on programs aimed at empowering Twitter users to build their critical thinking and connect them to resources in order to give them control over their online experience. Doris Jones, director of AUC’s Common Reading Experience highlighted how the CRE's collaboration with Twitter has allowed students to share reading experiences on a scale and in a fashion that would not previously have been possible. “Reading is foundational for all learning and this competition further highlighted changing reading practices in the age of online social networking and pinpoints a particular time during AUC's Centennial year that opens new vistas about the spread of knowledge, education, culture, and ideology,” she added. The impact of digitizing the CRE and introducing the social media component to the reading experience has proved beneficial, as Jones explained that students have been more engaged with Fahrenheit 451 because the text is an e-book, which allowed the CRE to distribute the text to hundreds of students and enabled students to read the book on their smart phones and other digital devices. “Also having Twitter as a partner places a spotlight on our chosen text, Fahrenheit 451, while also allowing our students to utilize social media as an opportunity to build a community of discussants around the text,” she added. While Twitter previously provided a Digital Literacy workshop with AUC’s A2K4D, this is Twitter’s first time, in Egypt and the MENA region, to launch a competition of an academic nature. “With the #TweetRight competition, our focus was to engage with students directly by addressing a present day challenge. We look forward to increased collaborations with AUC, specifically on more student-focused programs,” said Salama.